Lingshui endorses tourism & cultural resources! The Cultural Square of Lingshui county town, care for the guests worldwide with superlative hospitality features. Relishing the delicacies like Shanlan liquor, and Bamboo rice, guests observed the Sanyuesan Festival and felt the hospitality and enthusiasm of Lingshui. Jubilant singing and dancing, emotional recitation, momentous chorus, and a scenario show by foreign friends were included in an uncommon performance in which the growth and expansion of Lingshui was introduced in four parts: “Culture”, “Tourism”, “Delicacies” and “Future”. The guests commended the development of Lingshui and its priceless resources related to tourism. The Sanyuesan Festival is a major traditional festival of the Li ethnic group. It is crucial to endorse the traditional culture, improve the unity among all ethnic groups, and speed up the financial development. 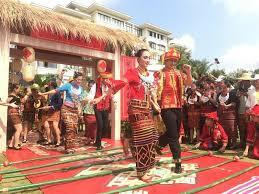 At present, it incorporates celebration, trade, tourism and cultural entertainment into an important event. By holding tourism promotion activities, Lingshui has successfully made a foray into the world. In the southeastern part of Hainan province, Lingshui is an independent county, and has plentiful tropical coastal resources and a gorgeous coastline. Tourists can experience the sceneries of a coastal resort there, which is a famous tourist spot. In addition to the beautiful natural sceneries, Lingshui also has rich historical and cultural deposits, long-standing folk customs, and impressive revolutionary culture. The Government of Lingshui arranged more than 25 activities. Citizens can witness the vibrant culture and beautiful environment of Lingshui while enjoying the festival. Tourists can explore the streets of ethnic customs for delicacies and agricultural products, tour revolutionary memories at Pocun Village, partake in a healthy run in Dali, experience the traditional wedding customs in Xiangshui Bay, and enjoy riding recreational vehicles along Qingshui Bay.